NOTE: These Cash Shop sales will be available following the game maintenance on June 21. Due to Daylight Saving Time in North America, the sale times may be shifted forward by one hour, ending at 12:59 AM PDT on the day after the listed sale end date. 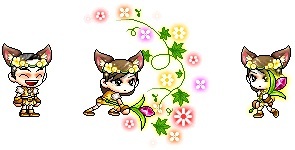 June 21 to July 18 in the Special Promotions > New Arrivals category in non-Reboot worlds only. 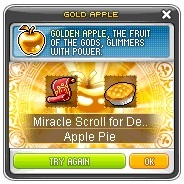 Behold the Golden Apple, a special item that will give you one random in-game item when you open it! It also gives you 10 Apple Pies, which restore 10,000 HP when consumed. Purchase a bundle of Golden Apples, and open them up to see what treasures you can find! We have removed Boost Scrolls 100%/50% from the Golden Apple, and have added the following items! [Update June 21] The male hairstyle 'Ice Pop Hair' was incorrectly marked as 'New'. This has been fixed in the post below. June 21 to July 4 in the Appearance category in both Reboot and non-Reboot worlds. Check out the Male Hairstyles available now: Ice Pop Hair, Sarim Hair Mod (NEW! ), Retro Romance Hair, Glossy Flyaway Hair, Aqua Hair, and Chic Tail Hair. Check out the Female Hairstyles available now: Anastasia Hair Mod (NEW! ), Roxxy Hair Mod (NEW! ), Danika Hair, Innocent Ponytail Hair, Glossy Flyaway Hair, and Goth Idol Hair. Check out the Male Face Styles available now: Meow Face (NEW! ), Sarim Ocular Mod (NEW! ), Doll Face, Dreamy Face, Sparkling Face, and Spring Fairy Face. Check out the Female Face Styles available now: Anastasia Ocular Mod (NEW! ), Roxxy Ocular Mod (NEW! ), Doll Face, Dreamy Face, Sparkling Face, and Spring Fairy Face. June 21 to June 27 in the Special Promotions > Limited Time category in non-Reboot worlds only. On June 24 and 25, we will be having a special deal on 1-Day 2x Coupons! Get twice the amount of EXP and drops for one whole day! You have until 12:59 AM PDT / 3:59 AM EDT / 9:59 AM CEST / 5:59 PM AEST on June 26 to purchase these items at a discount! The coupons activate immediately after purchase, so be sure to move them to your item inventory to use them as soon as you buy! June 21 to July 4 in the Special Promotions > Limited Time category in non-Reboot worlds only. Take home the Roo-bot pets, who have escaped from Gelimer’s lab! Choose from cheerful Roo-A, frightened Roo-B, or spunky Roo-C, or take home all three. Summon the Roo-bots to obtain the Roo-bot Shuffle skill, which will increase your Weapon Attack and Magic Attack. The skill will grow stronger as you equip more Roo-bot pets. The Roo-bots will become bigger as you fight monsters around your level. Eventually, they will reach giant status and cast a particularly awesome buff on your every 5 minutes! The individual pet packages come with an equip to wear, yummy pet food to eat, a paint coupon, a Pet Name Tag, and some useful pet skills and scrolls. You can change the color of your Roo-bot pet using the paint coupon included in the package. June 21 to June 27 in the Special Promotions > Limited Time category in both Reboot and non-Reboot worlds. Celebrate Beast Tamer’s return! Dress up like a guardian of the forest with these permanent items. June 21 to July 4 in the Special Promotions > Limited Time category in Reboot world only. Take home the Roo-bot pets: cheerful Roo-A, frightened Roo-B, or spunky Roo-C! Let these little buddies join you on your adventures in Reboot world! Updated June 21 in both Reboot and non-Reboot worlds.